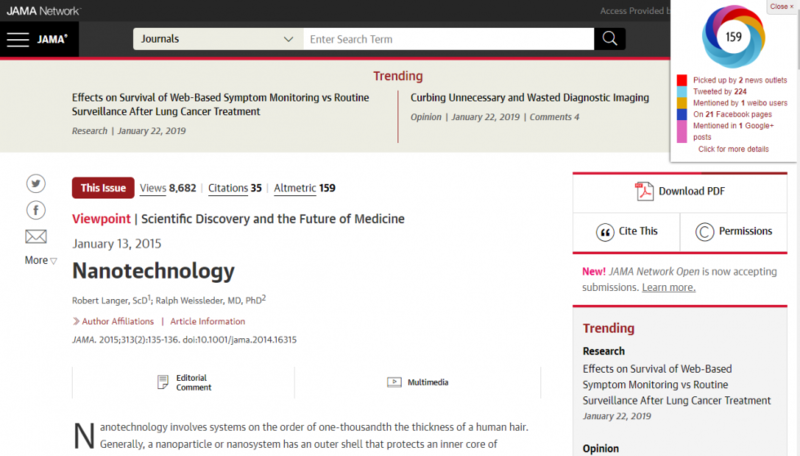 Altmetric is a web-based service that allows anyone to track, search, and measure the conversations about their research happening online on an article-by-article basis. Using Altmetric’s bookmarklet you can see who has been mentioning your work in major news sources, blogs, government policy documents, Wikipedia, and social media. Unlike other metrics, which are focused on the impact of a journal (impact factor, h-index, etc. ), Altmetric tracks your research at the article level, enabling you to assess the impact of your scholarship with a higher level of granularity. What can Altmetric do for me? Compare your work to others in your field. Discover what articles at Duke are getting the most attention and work to improve the reach of your own work. How do I use the Altmetric Bookmarklet? Visit this link and drag the bookmarklet into your web browser’s bookmark bar. Any time you visit a journal article’s page on the journal website (that lists a DOI or other identifier), you will be able to click the bookmarklet and see altmetric data on that article (below).